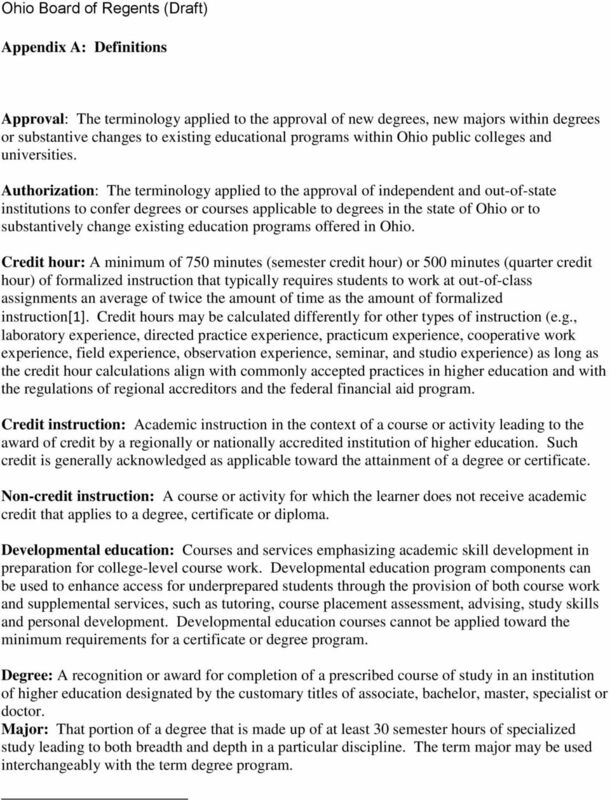 Download "Ohio Board of Regents (Draft) Appendix A: Definitions"
1 Ohio Board of Regents (Draft) Appendix A: Definitions Approval: The terminology applied to the approval of new degrees, new majors within degrees or substantive changes to existing educational programs within Ohio public colleges and universities. Authorization: The terminology applied to the approval of independent and out-of-state institutions to confer degrees or courses applicable to degrees in the state of Ohio or to substantively change existing education programs offered in Ohio. Credit hour: A minimum of 750 minutes (semester credit hour) or 500 minutes (quarter credit hour) of formalized instruction that typically requires students to work at out-of-class assignments an average of twice the amount of time as the amount of formalized instruction. 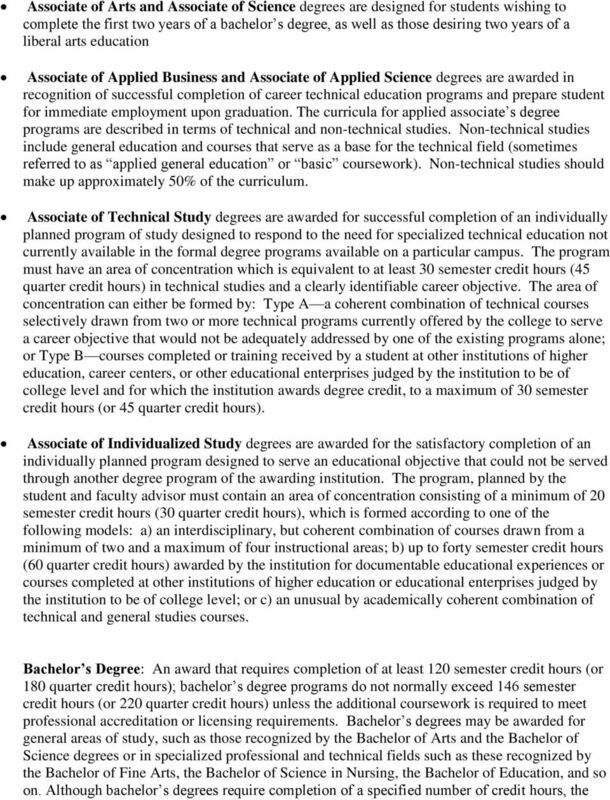 Credit hours may be calculated differently for other types of instruction (e.g., laboratory experience, directed practice experience, practicum experience, cooperative work experience, field experience, observation experience, seminar, and studio experience) as long as the credit hour calculations align with commonly accepted practices in higher education and with the regulations of regional accreditors and the federal financial aid program. Credit instruction: Academic instruction in the context of a course or activity leading to the award of credit by a regionally or nationally accredited institution of higher education. Such credit is generally acknowledged as applicable toward the attainment of a degree or certificate. Non-credit instruction: A course or activity for which the learner does not receive academic credit that applies to a degree, certificate or diploma. Developmental education: Courses and services emphasizing academic skill development in preparation for college-level course work. Developmental education program components can be used to enhance access for underprepared students through the provision of both course work and supplemental services, such as tutoring, course placement assessment, advising, study skills and personal development. Developmental education courses cannot be applied toward the minimum requirements for a certificate or degree program. Degree: A recognition or award for completion of a prescribed course of study in an institution of higher education designated by the customary titles of associate, bachelor, master, specialist or doctor. Major: That portion of a degree that is made up of at least 30 semester hours of specialized study leading to both breadth and depth in a particular discipline. The term major may be used interchangeably with the term degree program. 2 Technical Major: That portion of an applied associate degree that consists of 12 to 16 semester credit hours (18-24 quarter credit hours) of coursework and constitutes an area of specialization. Minor: A program of study that is made up of at least 12 semester hours in a particular discipline. General education: The set of courses and experiences that provide students with a broad exposure to multiple disciplines within the arts and sciences with the aim of providing students with the knowledge and skills needed to succeed in the 21 st century. In Ohio, the general education curriculum will include coursework in oral and written communication, mathematics and data analysis, humanities, natural science and social science. Online Course: A course where most (>80%) of the content is delivered online; typically the course will have no face-to-face meetings. Online Degree: A degree in where most (>80%) of the degree can be completed online. Blended/Hybrid Courses: A course that blends online and on-ground delivery; substantial content is available online and there are a reduced number of face-to-face meetings. 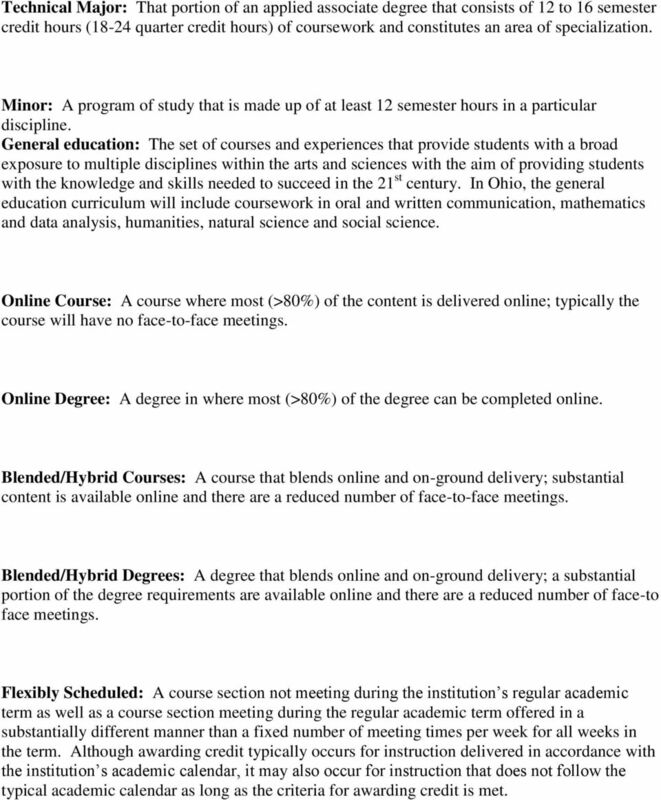 Blended/Hybrid Degrees: A degree that blends online and on-ground delivery; a substantial portion of the degree requirements are available online and there are a reduced number of face-to face meetings. Flexibly Scheduled: A course section not meeting during the institution s regular academic term as well as a course section meeting during the regular academic term offered in a substantially different manner than a fixed number of meeting times per week for all weeks in the term. Although awarding credit typically occurs for instruction delivered in accordance with the institution s academic calendar, it may also occur for instruction that does not follow the typical academic calendar as long as the criteria for awarding credit is met. 3 Dual enrollment: A form of enrollment that enables a student to earn both high school and college credit for a course during high school as a result of participating in a college course offered at the high school, at a college or university, or via distance learning. Concurrent enrollment: The form of enrollment occurs when an adult student is enrolled in two post-secondary educational institutions at the same time, receiving education programs, services and/or benefits from each. Regional campus: a campus that is geographically apart from and independent of the main or home campus of the institution. It should have all or most of the following attributes: it is permanent in nature; it offers at least one, but typically multiple degree programs; it has its own faculty and administrative structure, often including its own budgetary and hiring authority; and it houses academic resources, support services and operational services for the campus. Additional campus location: a place, geographically separate from any main or regional campus, where instruction takes place and students can complete 50 percent or more of the courses leading to a degree program or to a Title IV eligible certificate. 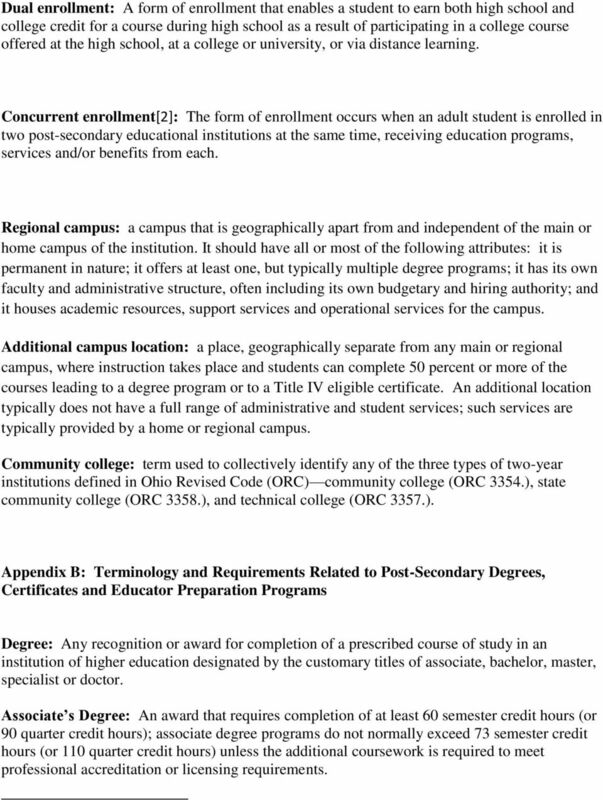 An additional location typically does not have a full range of administrative and student services; such services are typically provided by a home or regional campus. Community college: term used to collectively identify any of the three types of two-year institutions defined in Ohio Revised Code (ORC) community college (ORC 3354. ), state community college (ORC 3358. ), and technical college (ORC 3357.). Appendix B: Terminology and Requirements Related to Post-Secondary Degrees, Certificates and Educator Preparation Programs Degree: Any recognition or award for completion of a prescribed course of study in an institution of higher education designated by the customary titles of associate, bachelor, master, specialist or doctor. Associate s Degree: An award that requires completion of at least 60 semester credit hours (or 90 quarter credit hours); associate degree programs do not normally exceed 73 semester credit hours (or 110 quarter credit hours) unless the additional coursework is required to meet professional accreditation or licensing requirements. 5 length of the program can vary. For instance, bachelor s degrees may be conferred for a fiveyear cooperative (work-study plan) program, which provides for alternate class attendance and employment in business, industry or government. They may also be conferred in instances where the full complement of credits is obtained in three years. Master s Degree: An award that requires the successful completion at least 30 semester credit hours (or 45 quarter credit hours) of work beyond the bachelor s degree. Master s degrees such as the Master of Arts and the Master of Science are typically considered research graduate degrees, and involve preparation to carry out research and to discover new knowledge whether the field is pure or applied. Master s degrees may also recognize preparation for professional practice. Examples of professional practice master s degrees include the Master of Business Administration (MB A), Master of Science in Nursing (MSN), Master of Public Health (MPH) and the Master of Social Work (MSW). Specialist Degree: An award that generally requires the successful completion of at least 30 semester credit hours (or 45 quarter credit hours) of work beyond the master s degree. The specialist degree is typically considered a professional practice degree (e.g., the Education Specialist, or Ed.S) and may be pursued by individuals interested in furthering their education beyond a master s degree, but who are not interested in pursuing a research or professional practice doctorate. Doctoral Degree: The highest award a student can earn for graduate study. Doctoral degrees generally require the successful completion of at least 90 semester credit hours (or 135 quarter credit hours) of work beyond the bachelor s degree. The Doctor of Philosophy (PhD) is typically considered a research degree and involves preparation for the conduct of independent research and the discovery of new knowledge. Doctoral degrees may also recognize preparation for professional practice. Examples of professional practice doctoral degrees include the Doctor of Nursing Practice (DNP), Doctor of Education (Ed.D.) and Doctor of Physical Therapy (DPT). Certificate: A formal award certifying the satisfactory completion of an organized program of study at the postsecondary level. One Year Technical Certificate: Certificates awarded by community colleges for the completion of a minimum of 30 and a maximum of 37 semester credit hours (45 to 55 quarter credit hours) of coursework, with the majority of the coursework completed in a prescribed technical area. These certificates should be applicable to an associate degree, either at the student s home campus, at another community college within commuting distance, or through a distance education partnership with another campus Short Term Technical Certificate: Certificates awarded by community colleges for the completion of less than 30 semester credit hours (45 quarter credit hours) that are designed for a specific employment situation. 6 Undergraduate Certificate: An award that requires completion of an organized program of study at the postsecondary level (below the baccalaureate degree) that does not meet the requirements for a bachelor s degree. These certificates are classified by IPEDs as either at least 1 but less than 2 academic years or at least two but less than 4 academic years. Post-Baccalaureate Certificate: An award that requires completion of an organized program of study beyond the bachelor s degree (typically at least 18 semester credit hours or 24 quarter credit hours); designed for individuals who have completed a bachelor s degree but do not meet the requirements for a master s degree. 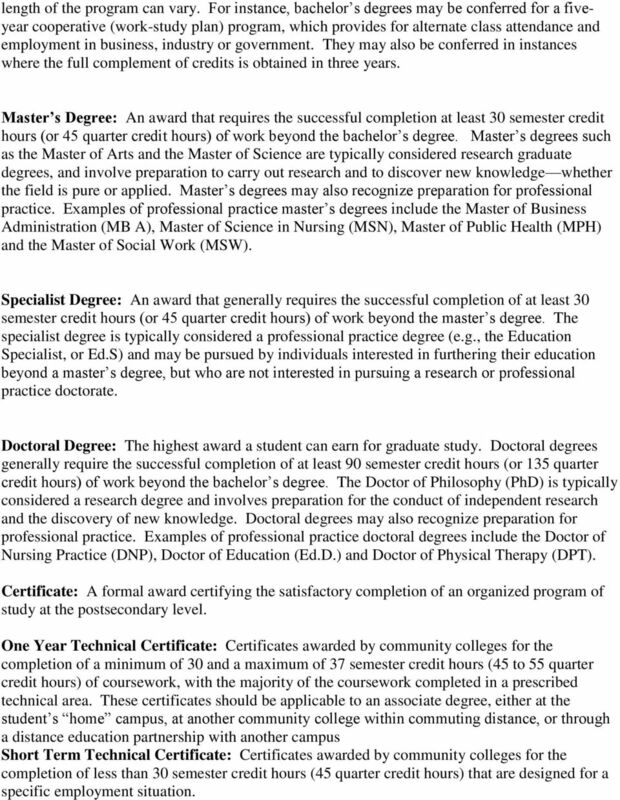 Post-Master s Certificate: An award that requires completion of an organized program of study beyond the master s degree (typically at least 24 semester credit hours or 36 quarter credit hours) designed for individuals who have completed a master s degree but do not meet the requirements for a doctoral degree. 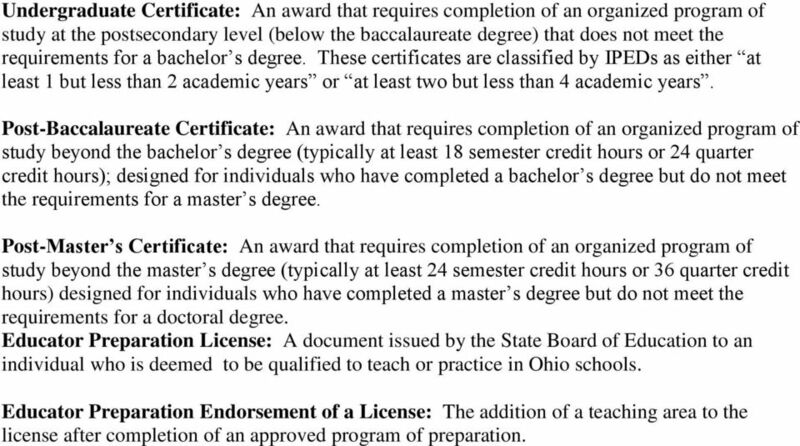 Educator Preparation License: A document issued by the State Board of Education to an individual who is deemed to be qualified to teach or practice in Ohio schools. Educator Preparation Endorsement of a License: The addition of a teaching area to the license after completion of an approved program of preparation. (3) A minimum of 12 semester units or 18 quarter units among the arts, literature, philosophy and foreign languages. (8/25/15) These designations are to be used by all academic units to describe the areas of study within the unit. Frequently Asked Questions Regarding U.S. Higher Education English Now! Texas A&M University-Kingsville Responses to H.B. 1172 Timely Graduation Report Requirements November 2007 This report has been prepared in compliance with Section 1, H.B. 1172 of the Texas Education Code. Policy No. 031. AUTHORITY: Each campus will appoint a person to serve as a transfer coordinator to assure that policies and procedures are followed. COLLEGE APPLICATION LINGO Need help understanding some of the vocabulary words used in the college application process? Here s a helpful list for you! The Accreditation Alert can also be found on the Commission s website at: www.accsct.org. Go to Staying Accredited and then Accreditation Alert.